Hoen Shinpo contains a set of openings for both handicap and even games. These openings represent the "Shusaku style" as it was formulated about 20 years after Shusaku's death. The interest of these openings today is in relation to the discussion about the roots of shin fuseki, and more generally the rise of modern opening theory. The phrase "Shusaku style" surely means more than the 1-3-5 Shusaku fuseki pattern and the Shusaku kosumi. It relates to the full development of patterns based on 3-4 points, as a thick style for Black. That was of course in the days before komi. The book The Theory and Practice of Go by Oscar Korschelt contains sample whole-board openings by Honinbo Shuho. While the openings were taken from manuscript writings of Honinbo Shuho; the commentaries in The Theory and Practice of Go are by Korschelt and differ greatly from those of Shuho. 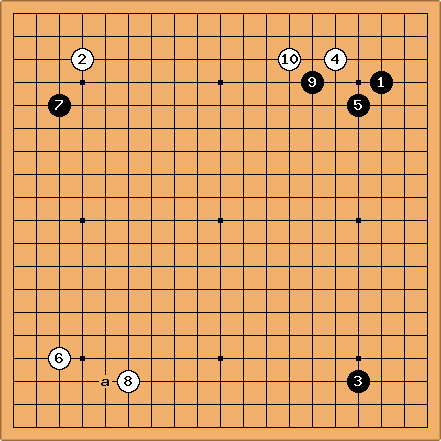 This example is with the Shusaku kosumi before occupying the third corner ( at is the orthodox play). Therefore this is bound to look slow by modern standards. On the other hand , rather than a, is a looser enclosure. It is White who is making the pace. avoids complicated taisha joseki variations, transposing after into a line of the press 3-5 joseki. one to the left (footsweep), to take sente? Is Black going to ignore that, equally? is of course severe on White in the upper right. White responds with a wedge when the approach lower right was possible. This is very much like handicap Go, from White.